When cleaning is your business, the Self-Contained 9 Gallon Extractor is the walk-behind extractor for you. Get your cleaning done no time. The floating brushroll, fixed vacuum shoe and 18-inch wide cleaning path provide maximum recovery and cleaning power. Walk-behind upright extractor with a floating brush and a fixed vacuum shoe provides maximum recovery and cleaning power. Large wheels for balance & transport. The see-through 9-gallon recovery tank lid and easy-access solution switch on the handle make for easy operation. 18-inch cleaning path and motorized chevron brushrool clean efficiently and quickly. 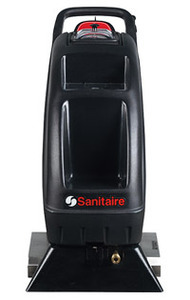 Get the power to clean the dirtiest carpets with the Sanitaire Self-Contained Upright Carpet Cleaner, model SC090. This unit combines a high performance two-stage motor with a heavy-duty motorized brush and 100 PSI pump to take deep cleaning to a new level. UL listed for commercial use, this cleaner has a 9-gallon tank, 17-inch cleaning width, extra large wheels and a detachable 50-foot power cord that allow the user to have powerful cleaning performance in any room. Entirely self-contained unit combines high-performance two-stage motor and heavy-duty motorized chevron brush for powerful, high-quality deep cleaning. 17" wide cleaning path. Simply press the cleaning solution button to easily dispense cleaning solution ith 100 psi pump; 9-gallon tank capacity. Automatic suction safety shut-off if unit tips over. Extra-large, 12" easy-roll wheels and molded handle for mobility. Detachable three-wire, 50-ft. power cord. UL Listed for commercial use. Manufacturer’s limitedone-year parts/labor warranty. Shpg. wt. 125 lbs. Walk-behind upright with fixed vacuum shoe. When you have a lot of carpet to clean, this walk-behind upright extractor with a floating brush and a fixed vacuum shoe provides maximum recovery. Designed for easy operation, Large wheels for easy balance & transport, a see-through recovery tank lid and easy-access solution switch on the handle make this extractor easy to operate. 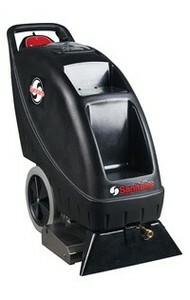 Sanitaire SC6095A 9g Self-Contained Carpet Extractor Model SC6090 Upright Carpet CleanerNeat self-contained unit combines high-performance two-stage motor and heavy-duty motorized chevron brush for powerful, high-quality deep cleaning. A 17-inch wide cleaning path gets more done faster. Easily dispense the cleaning solution with 100 psi pump; 9-gallon tank capacity, by simply pressing the cleaning solution button. The automatic suction safety shuts off if the unit tips over. Extra-large, easy-roll wheels and molded handle for mobility. Detachable three-wire, 50-ft. power cord. Extractor Type: Portable; Recovery Tank Size (Volume): 9 gal; Water Pressure: 100 psi; Water Lift: 120. Get the power to clean the dirtiest carpets with the Sanitaire Self-Contained Walk Behind Upright Carpet Cleaner, model SC6095A. This unit combines a high performance Three-Stage motor with a Heavy-Duty motorized Brush and 100 PSI pump to take deep cleaning to a new level. UL listed for commercial use, this cleaner has a 9-Gallon tanks, 18-inch cleaning width, extra-large wheels and a detachable 50-foot power cord that allow the user to have powerful cleaning performance in any room.